Three council Leaders have teamed up to look at possible locations for a new opening bridge across the Clyde. The new bridge, which will accommodate vehicles, pedestrians and cyclists, will increase the potential for business growth by improving connections with customers and suppliers on both sides of the river. It will also enhance access to land which is currently underused or derelict; unlocking the potential for regeneration and new developments in the Yoker, Clydebank and Renfrew areas. 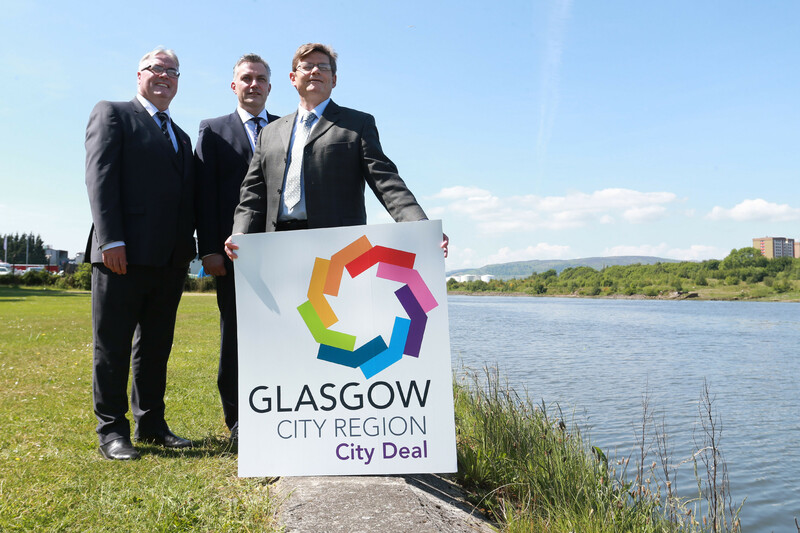 The Glasgow City Region City Deal is investing more than £1billion on infrastructure projects throughout the region. It will also support the creation of thousands of new jobs, assist thousands of unemployed people back to work, improve public transport, drive business innovation and growth, and generate billions of pounds of private sector investment. Residents and businesses can meet the City Deal Project Team, see the plans and find out more about the project on Thursday 16 June at St Margaret of Scotland Hospice Education Centre, Clydebank and on Tuesday 21st June at Yoker Community Campus. More information about the community events, the new bridge and other City Deal projects can be found at www.renfrewshire.gov.uk/citydeal. More information about the Glasgow City Region City Deal can be found at www.glasgowcityregion.co.uk.